According to a survey of mommy bloggers, greater social connection improves moods. 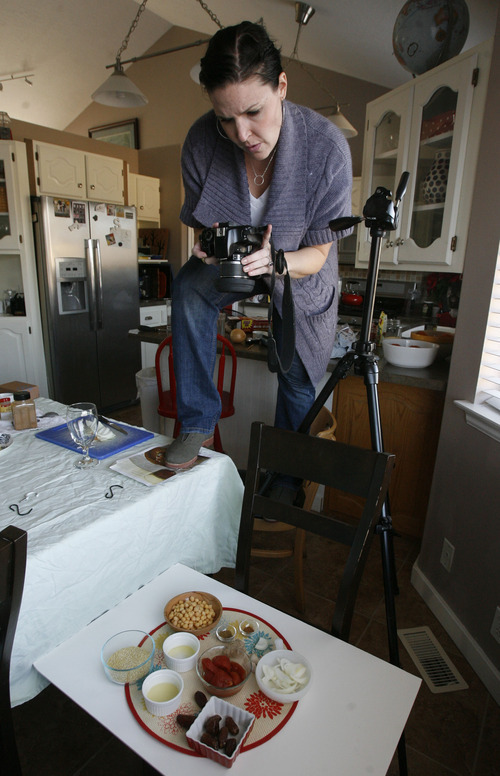 Francisco Kjolseth | The Salt Lake Tribune Allison Czarnecki, a mommy blogger from Spanish Fork, takes advantage of window light to document a new vegan recipe in her kitchen for the family dinner on Monday, Jan. 9, 2012. Czarnecki, who started her blog petitelefant.com in 2007, has a following of about half a million a month. A recent study shows that stay-at-home moms who blog are much happier due to an increased social network that keeps them connected. 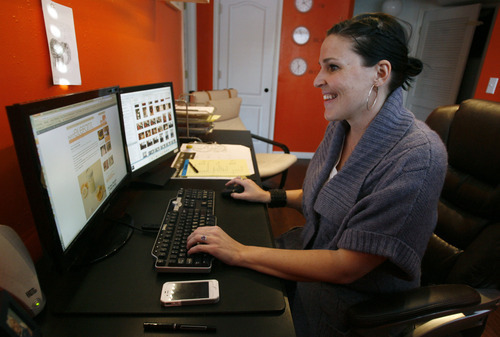 Francisco Kjolseth | The Salt Lake Tribune Allison Czarnecki, a mommy blogger from Spanish Fork, keeps connected from her basement home office on Monday, Jan. 9, 2012. Czarnecki, who started her blog petitelefant.com in 2007, has a following of about half a million a month. A recent study shows that stay-at-home moms who blog are much happier due to an increased social network that keeps them connected. Francisco Kjolseth | The Salt Lake Tribune Allison Czarnecki, a mommy blogger from Spanish Fork, works on updates to her blog from her basement home office on Monday, Jan. 9, 2012. Czarnecki, who started her blog petitelefant.com in 2007, has a following of about half a million a month. A recent study shows that stay-at-home moms who blog are much happier due to an increased social network that keeps them connected. 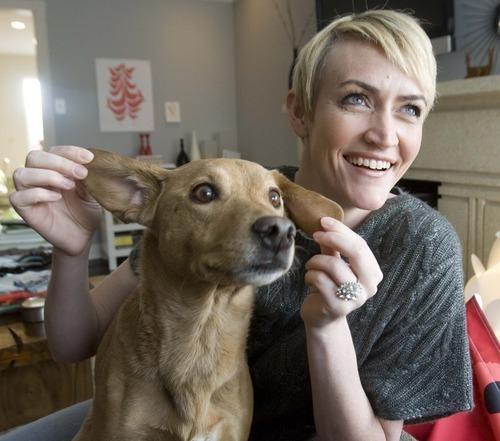 Paul Fraughton | Tribune file photo Famed Utah mommy blogger Heather Armstrong plays with her dog Chuck in this file photo. A recent study shows that stay-at-home moms who blog are much happier due to an increased social network that keeps them connected. Famed "mommy blogger" Heather B. Armstrong said the Internet saved her life. Thanks to the support she received from readers and other new mothers who had experienced the same post-partum issues, the Salt Lake City woman and author of the popular lifestyle blog, Dooce.com, said she checked herself into a psychiatric clinic and got the help she needed. Armstrong's experience with blogging and the Internet reinforce new research findings from a Brigham Young University graduate student who learned that "mommy blogging" can boost maternal well-being. Brandon McDaniel, a BYU psychology major who is now working on his master's and doctorate degrees in human development and family studies at Penn State, surveyed 157 new mothers. Of those, 111 read blogs at least sometimes, and 96 of them started their own blogs about their experiences as a parent. For the study, he asked them questions about depressive symptoms, the quality of their marriages and their level of parenting stress. "The more they blogged, the better they felt," he said. "I can't say it's causal in nature  there needs to be more research … but right now, the research suggests that the more they blog, the more it turns into feelings of greater social connection." McDaniel, who started the research after he and his wife started their own blogs as new parents, published his findings in the Maternal and Child Health Journal. Mothers may be able to share successful personal experiences on a blog or social networking site and receive feedback from other parents that will reinforce perceptions of social support, McDaniel wrote in the paper titled "New Mothers and Media Use: Associations Between Blogging, Social Networking, and Maternal Well-Being." "Mothers may also learn through observation or vicarious experience as they read about others' experiences." In 2010, 3.9 million women in the U.S. with children younger than 18 years had blogs, according to online analysts, eMarketer.com. Armstrong, who has turned Dooce.com into a national forum for new moms, said blogging about her depression ended up being a way to reach out for help. "I'm probably the paradigm for having blogging help you in terms of depression. I credit my audience with saving my life," she said. "Blogging has sort of given us our village back," she added. "When I had my first child, all of my friends with children were online and scattered around the country. Without them I would have been so desperately lonely and depressed." Allison Czarnecki, 34, another professional "mom blogger" and author of http://www.petitelefant.com, said social networking and blogging opened up the lines of communication for her when she began her blog five years ago. "I've met friends over the course of the five years that I've been blogging with who are kind of like soulmates," said Czarnecki, who lives in Spanish Fork and has two children. "For me, it has completely created a sense of belonging and this whole world of people I would not have otherwise met." One part of McDaniel's research also discovered that while blogging may help new mothers, social networking through services such as Twitter and Facebook do not. "There's just a different atmosphere on the two outlets [between social networking and blogs]," he said. "It may be that the interactions aren't as personal as they might be. The problem with Facebook at times is you may not be getting the same sense of community."